Berenice has evolved from an ancient city that was used as a trading post to one of the more beautiful gems on the Red Sea Coast. The ancient city of Berenice was named by Ptolemy II after his mother, and became a trading port in 275 BCE. Back then the town of Berenice was a consistent trade area which involved other countries like East Coast Africa, India and Arabia. Today Berenice is known for its port and a fascinating tourism centre. Berenice is the most southern tourist area in Egypt. It is situated about 300 km east of Aswan. 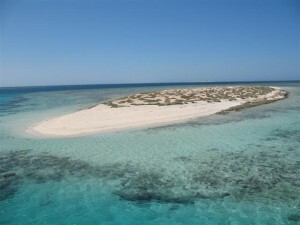 Marsa Alam, approximately 230 km north of Berenice, is the closest airport. The journey by road from the small international airport takes around three hours. Berenice gives a whole new meaning to the phrase ‘be one with nature’ as you should not expect to see bars here or clubs and not to mention shopping areas. Instead prepare to be wooed by the towns’ unspoilt beauty. Berenice and its surroundings have a fascinating landscape. A mysterious magical land, where the desert transforms itself into a pre savannah and the coast is lined with palm tree groves, mangrove swamps, and unspoiled coves and bays with pristine almost primitive colourful beaches. Bird watching is very popular, with many species attracted to the mangrove areas. The pristine beaches and coves are the ideal destination for those seeking a beach vacation away from everything and everyone and close contact with nature. Berenice also has some of Egypt’s best health spas. They offer all that is required to stimulate your mind, body and soul. Above all however, Berenice is a paradise for diving enthusiasts. The reef here is still intact and offers spectacular hikes. Most of the coastal area of Berenice belongs to the Wadi Gemal National Park. Wadi Gemal is one of the most celebrated and thriving national marine parks in Egypt. It is well protected by a series of strict environmental laws and conservation organisations. The diving centres in the marine area of Berenice operate under environment friendly procedures as well. There are various possibilities, for both experienced divers and beginners to explore the beautiful coral reefs and watch rays, dolphins, sharks and turtles. The diving centres are all well equipped and offer reliable and professional services, ranging from scuba diving beginner certification courses to professional courses and technical diving, and providing guided dives to the area’s outstanding reefs, introductory dives and diving packages, with one, two or more dives per day, for those who are certified. For the non-licensed diving enthusiasts, the centres offer free of charge pool intros, where visitors can experience the thrill of scuba diving on a one-to-one basis with a diving instructor in the hotels swimming pool. The diving centres also offer experience programmes, where the visitor can try actual dives in the sea straight away, under the strict supervision of a diving professional. Scuba diving can be performed from shore, or with comfortable boats going out for a day or a half-day trip. The area offers some of the top-class dive sites, depending on what you fancy. Fringing reefs, lagoons, drop-offs or wrecks are some of the options so you certainly won’t get bored, diving amongst magnificent coral formations. Sha’ab Sattaya (The Fury Shoals): a crescent-shaped large reef home to a huge pod of timid Spinner Dolphins. Sha’ab Makhsour: only for experienced divers, this is the big tower plummeting to unfathomable depths where there is a constant passage of pelagic, with the highest number of shark species present in the Red Sea. The underwater gems of Qulan Islands, also called the Maldives of the Red Sea. Turquoise waters. White sand. Shallow lagoons. Colourful corals. Tropical fish. The one difference? They aren’t atolls. The islands of Qulan are formed by fringing reefs atop a sandy ledge. The living coral reefs in the Red Sea have a huge variety of fish and corals, thousands of life forms other than the bright colours and fantastic shapes. Among the fish that inhabit the coral reefs are the most popular fish, wrasse, lion fish, grouper, moray eels, angelfish, butterfly fish, clown fish and parrot fish. Near Berenice a few mountains offer excellent attractions for special travel experiences. For climbers, there is the challenge of Egypt’s ‘most aggressive peaks’, Mt. Farayid and the Berenice Bodkin – the largest rock needle in the whole of North Africa and the Middle East. These mountains are definitely not recommended to those with little climbing experience. Surely you’ll find a tour which will meet your satisfaction. Berenice also has a small Bedouin museum, where you can learn about nomadic tribes. A ruined Temple of Serapis built by Trajan and Tiberius is near the modern centre of Berenice. On the outer walls of the temple are representations of Emperor Tiberius before the god Min, and another depicts offerings to the deity of the Green Mines. High waterless mountains, a valley alternately dry and flash-flooded, mangroves forests, palm groves, a salt marsh, sand dunes, white sandy beaches with crabs scuttling in the waves, a coral reef, a sea-grass bed, four offshore islands; Wadi Gemal National Park contains a diverse range of ecosystems supporting a wide variety of plants and animals. Wadi Gemal National Park or the Valley of the Camels opened in 2005. It is a protected area and one of the last places in Egypt where you can still find wild gazelle. The park stretches almost 100 km along the coastline. The park also stretches into the desert and covers a 60 km deep dry riverbed. What the park showcases is nature at its pristine best and the surprising number of animals that live in the desert, including the African donkey, Syrian ibex, wild camels, scorpions, sand cats and snakes. On a regular base there are guided park tours. You can visit the beach and mangroves from the coastal road, or take an organised trip by camel or four wheel drive to see the wadi and the mountains. The scenery is spectacular and a surprising amount of wildlife lives here. Accommodation is provided in eco-lodges. Another hidden treasure you’ll find in Wadi Humaysara. It is the ancient tomb of the 13th century Sufi Sheikh Sayyed el Shazli, who is known outside Egypt as Sheikh Abul Hassan el Shazly. He was one of the more important Sufi leaders. Legends tales that El Shazli wanted to be buried in a place, where no one has ever sinned, justifying why his tomb is built in the middle of nowhere. You can enjoy a memorable and authentic experience by attending his Moulid, a celebration marking a saint’s birthday. It is celebrated on the 15th day of the Islamic month of Shawal. If you are a nature lover you might want to explore the amazing landscapes and wildlife of the Elba National Park which lies between Berenice and Egypt’s border with Sudan. This mountainous area harbours a surprising variety of bird species including the Sooty Falcon, the Crowned Sand grouse and the Pharaoh Eagle Owl. Its highest peaks, including Mt. Elba (1,435 m), form a ‘mist oasis’. The surrounding cloud that shrouds the mountain tops creates moisture laden dew. This is the reason for the relative abundance of local flora, fauna and wildlife. Shalatin Market is a trading place near de border with Sudan. It has the most important tribal market in this part of southern Egypt. It is a melting-pot of different cultures. Sudanese bring camels and mostly handmade items, trading them for necessity goods not available in their country. You will meet the Rashaida, a wealthy Arab tribe completely dressed in violets, who are the main camel breeders. The Bisharin and the Ababda are tribes that have their origins further south. They carry a whip or a dagger as symbols of their status. After finishing their business they return to which ever remote places they came from. Little shops are spread out over the market area with an incredible amount of various goods. Offshore lies the small tectonic island of Zabargad (Arabic for peridot), a geological phenomenon, which is famous as the source of the semi-precious gem peridot in ancient times. Peridot was once the national gem of Egypt. Ancient Egyptians knew it as ‘the gem of the sun’. Peridot was mined for over 3,500 years on Zabargad Island, which in ancient time was known as the Serpent Island, then the Island of Topazos, followed by St. John’s Island, and currently Zabargad. From Peridot Hill there are breathtaking views of the surrounding blue lagoons, rich in marine life and home to many dolphins.